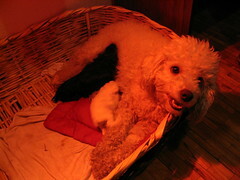 Last week, the landlord’s dog Bella gave birth to four puppies. They came to get me at 10:00 to say that she was starting to deliver. I really wanted to see it. But when Will and I went over there, she didn’t perform. She was visibly uncomfortable, but it would be another four hours before the first puppy came. I stayed up and went over there a few times, but by 12:30 I had given up hope that it was going to happen soon. In the morning, there were a total of four pups. Two black ones, a white one, and a tan one. The white one is the only male and is the runt. They’re going to keep one of the pups and sell the others. They’re trying to decide between the oat-colored one (as they call it) or the black one with the beard and tie (she has two patches of white, on her chest and her chin).